It's March 21st and definitely the start of spring: ladybirds busily hurrying about (all natives too! ), the amazing green of new leaves just out of buds, spawn in the pond (at home) and... the mallards are back, three of them (at the allotment)! "Mallards are dabbling ducks and are usually seen looking for the leaves, shoots and seeds of water-based plants. When these are submerged, the ducks up-end yet it has been known for Mallards to graze grasses, including cereal plants, as well as to deliberately shake vegetation to loosen any seeds and invertebrates that were out of reach. Mallards will also eat insects and their larvae, small fish and when the need arises, will even eat small mammals. Their tolerance of people has allowed them to make the most of any food that is freely given." so they are more likely to be the reason why no frogs have taken residence in the allotment pond than to cause any damage with the veg. And talking of frogs, last week was a hard one: as it rained for the first time since the good weather, all the frogs came out to breed and just down the road it was a massacre: I counted 9 killed, 1 wounded and in distress - very very unpleasant images are still at the back of my mind. I had no idea I was so keen on frogs, but now I do, and this morning, when I spotted spawn in my home pond (which is tiny), I decided to dig another one and make a log pile, so that more of the slimy creatures can come and stay in my garden. Over the week I learned other facts about them: they do not eat for the whole of the breeding time and they can drown while mating! Frogs have an urge to go back to the pond they were born into, so the few I rescued from the road were probably back shorly after I released them. In the UK there is a charity that monitors amphibian & reptiles. Anyway, I finished long after dark, and the mother frog watched me closely all the time - I had never seen her so exposed before, usually they hide under vegetation. The leeks have self-seeded massively, and are growing fast, so I am considering keeping the bed for one more season - they seem healthy, but that means I will have to make space somewhere for the cardoon next week, as it will be ready to transplant. It was great to be out in the sun, and although probably tomorrow I won't be able to move a single muscle, it was a great way to spend the first day of spring. Today I spent another great afternoon, on a delightfully sunny day, at the allotment. There is not much to talk about, really, but it was great fun as I increased the size of the asparagus bed to plant the new ones I got last week - the hickory axe and the recycled fence panels from my garden are coming so handy on the plot: the new bed is much more solid and nice looking than before, and hopefully the asparagus will thrive! I then decided where to plant the Jerusalem artichokes, on the side of a couple of shortish beds. I digged a small bed, just enough for the 5 or so tubers I've got, and built a wooden support for the plants, which can grow as tall as 2.5 m.
Jerusalem artichoke is actually a type of sunflower, whose tuber (a stem tuber, like a potato) tastes like an artichoke. They show a weedy behaviour, so they are always grown on the same spot. The tuber, which I read is a good source of iron, should be planted in early spring in well conditioned soil. I hope when I plant them in the next couple of weeks they like the spot I chose for them! You may have noticed that I have not mentioned study for a while... I will try to make the next post on that, and to write my paper this week. What a tangible sign of spring when the broadbeans are out once again! For a moment I thought it was some horrible weed, as I could not recognise the shape of the shoots. But it's definitely broadbeans, and I will probably manage to find space for sowing some more. Some of the seedlings in the greenhouse seemed to be out already (0-35C inside over the last week) but did not have time to check in detail as I spent all the afternoon digging to clear the raspberry bed. Onions and garlic are also out and found plenty of onion clumps (and some potatoes, really healthy) among the soft fruit stumps, so tomorrow I will have to transplant them, together with some new asparagus I bought last week. 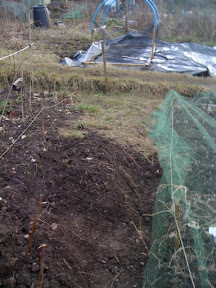 I will also find a place for the Jerusalem artichoke and hopefully de-fleece the herbs. I am chasing my recent enthusiasm for beetroot, so last week I tried a beetroot gratin at restaurant Konstam in London* that turned out to be delicious: slightly smokey in flavour, it seemed to consist of thinly sliced beetroot, red onion and cream. And this weekend I tried beetroot and chocolate muffins. Well, it was really beetroot and cocoa. Found a few recipes online that all resembled each other (i.e. BBC, Delia) but had to adapt as I did not have any corn oil. cooked 35 mins on gas 6. My husband seemed to like them (he wrote me an email this morning just to say!) but I am not completely convinced. Tomorrow I will try another one :). Somehow I believe it would taste better if I used chocolate chunks instead of cocoa powder - I'll try next time. It's almost time to sow both beetroot and aubergines - in the meantime, to keep the recipe fresh in my mind, tomorrow I will cook again my Bloody Good Pasta. Why not, I will try to improvise a gratin next time. And, should I ever ran out of beetroot recipes, I have found a website that seems to have quite a few, interesting ones!